TheFaceShop (TFS) is a Korean brand that sells Cosmetics & Skincare. What I like about the brand is that they use natural ingredients. Unlike SKINFOOD which is also a Korean Brand, TheFaceShop products are much cheaper. GREEN - neutralizes redness & evens out skintone. VIOLET - neutralizes and brightens yellow tone for healthier complexion. If you want a makeup base that has SPF, don't worry! 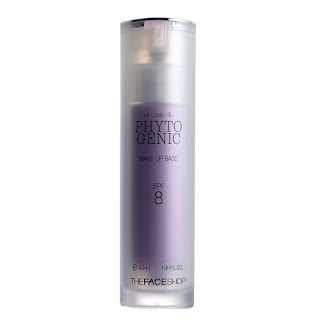 They also have PHYTOGENIC makeup base. Its made of Botanical extracts such as Persimmon leaf extract & silicon which feels light on the face & it makes skin breathe. Also available in 2 colors, Green & Violet. Another TFS product that I like is the Fruits Jelly Tube, it smells & tastes like candy! So yummy! It comes in delicious fruit flavors such as strawberry, apple & pomegranate depending on the gloss color. I bought the RED one, it tastes like strawberry. Its so glossy and it doesn't dry the lips. It also promises to retain moisture in the lips.